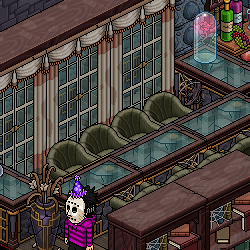 The Habbox Helpdesk has undergone a spooky transformation this evening. 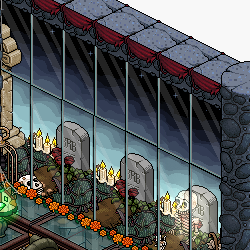 After you voted in our recent poll, the winning Halloween themed design was created by Mrs_Plant. The room has now been created for all to enjoy, and you can head on down to it by clicking here. 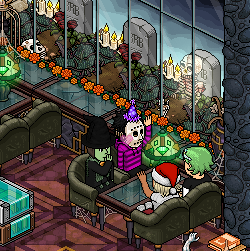 This new layout comes just in time for our annual Habboxween event, which kicks off on Wednesday, and runs for one week. 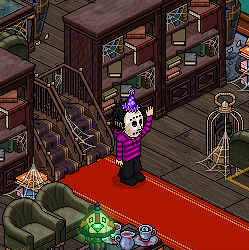 Habboxween promises to bring you plenty of fun events, competitions and quests for you to get your fangs stuck into- with the chance of winning lots of prizes along the way! There are plenty of ‘tricks and treats’ up for grabs. Which will you choose? Be sure to keep an eye on our forum for more details on Wednesday! Continue reading to see some screenshots of the new Habbox Helpdesk layout! Let us know what you think in the comments below. 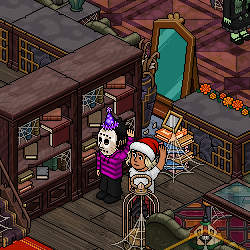 If you would like to work for Habbox (be it in our Helpdesk or one of our many other departments), simply check out habbox.com/jobs.